Typical to myself, I had promised MK earlier in the day, or the previous day, I don’t remember, that I was going to try to take it easy. Make me laugh! Why I would say something like that is beyond me because it is next to impossible. I did my morning things and sat down for a bit. Christian came over, looking for the portable crib to take to Michigan with them. We sat down and talked a bit and noontime was approaching as he departed to pick up the young lady from pre-school. I had a bite to eat and then headed out to straighten up the garage a bit. I realized I wouldn’t want to straighten up the house after being in the garage so I did that first. What might have been a short time of work ended up being to mid to late afternoon as I put things away, cleared areas, and vacuumed leaves that had blown in to prepare for winter. I am not truly sure why I even do it because it is an almost guarantee that the garage, my truly pseudo basement since I don’t really have one, is going to be a probable mess by spring. When it is freezing cold out and there are things to put away, it is hard to maintain the “clean.” Add into that mix the fact that I have three sons who still manage to get their fingers into my garage and still have things stored there. I did it anyway and came into the house. The garage was far from perfect but I pretty much know where everything is and I can now actually house a car within its less than perfect walls. 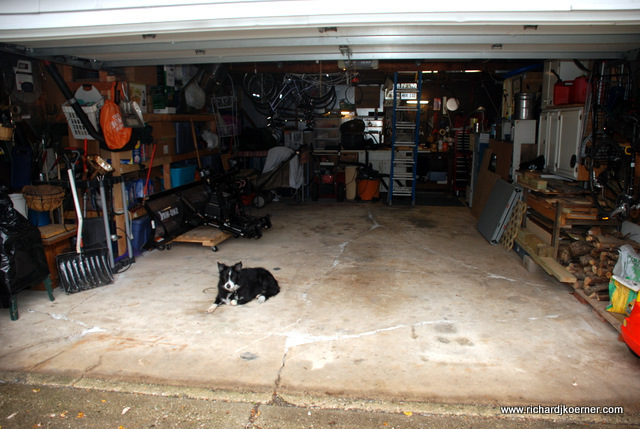 The garage was built as an afterthought, from what we can see, after the sturdy house we live in was put up. It looks as if it were one of those “flash and cheap” jobs, the quality lacking. The floor of the garage has massive cracks and the siding was originally particle board that was painted. We covered that with siding, but there is only so much you can do to hide imperfection. It is a two and a half car garage and extra deep, so I guess I shouldn’t complain. I had thought to connect my iPhone to the speakers on the tool bench and then plug in the heater to make my job easier. Well, typical to my situation, the speakers were non-existent! Someone had filched them! The heater did its job, but I soon realized that if I turned on the heater and the shop vac that the circuit breaker would do its job and cut the electricity, so I soon adjusted to that. Okay, so I am back in the house, one would think I would put my body into a chair, but no, one of the sections of the wall unit in the family room called out to me and I decided to straighten up and move my French materials into the area where I had kept my old office. I took some time, pretty much cleared out the cabinet and reorganized the materials. Then I sat down after showering. Ali had a great day, she and I had been outside, she often in the drizzling rain while I messed around in the garage. All in all, it was successful and despite my inability to understand my own character and personality, I cleaned up quite a bit. MK is home today, it is almost six o’clock and I am fully awake in the armchair writing this as I sip my cup of coffee. I am going for a swim before she gets up. Of course my internal clock woke me up needlessly at five thirty and she still sleeps, victim of teaching four or more classes within a single class for the several classes she teaches, victim as well of contract negotiation frustrations and political jockeying. Oh, and did I mention scandalous activities with sexting at the Lake Forest middle school that have ramifications within Lake Forest High School? She needs her rest, I am off to the gym! Swim time! This entry was posted in Family, Language, Life in general, People and their characteristics and tagged eccentricity, Facets of my behavior, Honey Don't List. Bookmark the permalink.